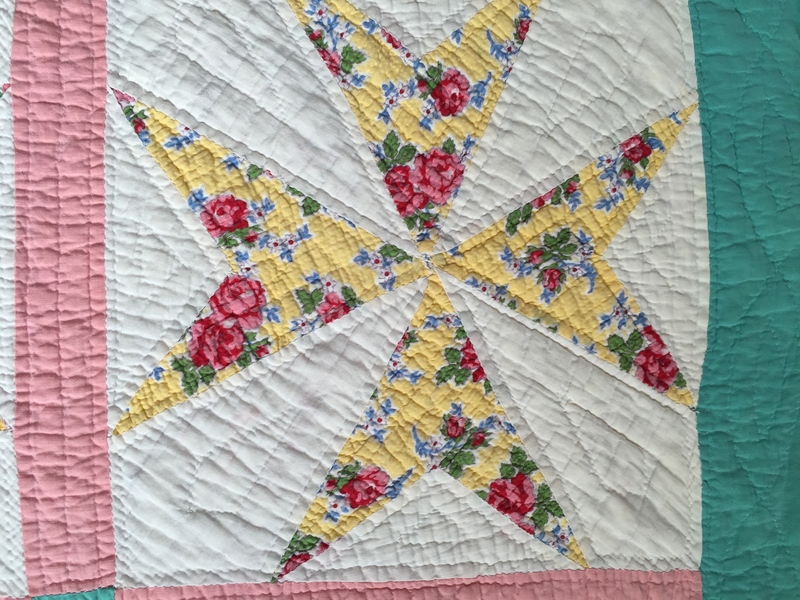 The Four Petals quilt was made in Kentucky by Lucy M. Hauser during the 1940s. It is hand pieced and hand quilted. 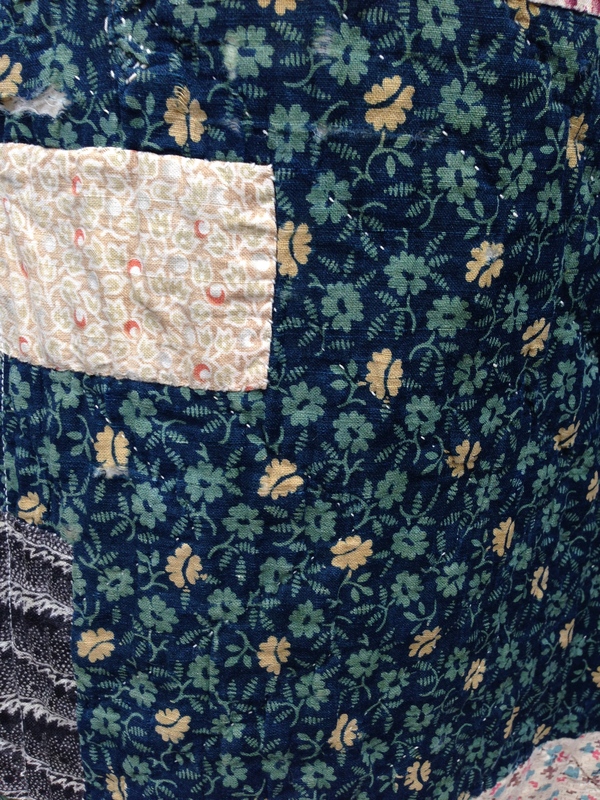 The fabrics used in this quilt are feed sack and dress fabrics. The borders, lattice strips and setting squares are a bright pink and aqua. The backing is a feed sack print in a dainty pink floral which compliments the pink and aqua fabrics perfectly. The binding is of the same fabric and is machine stitched. 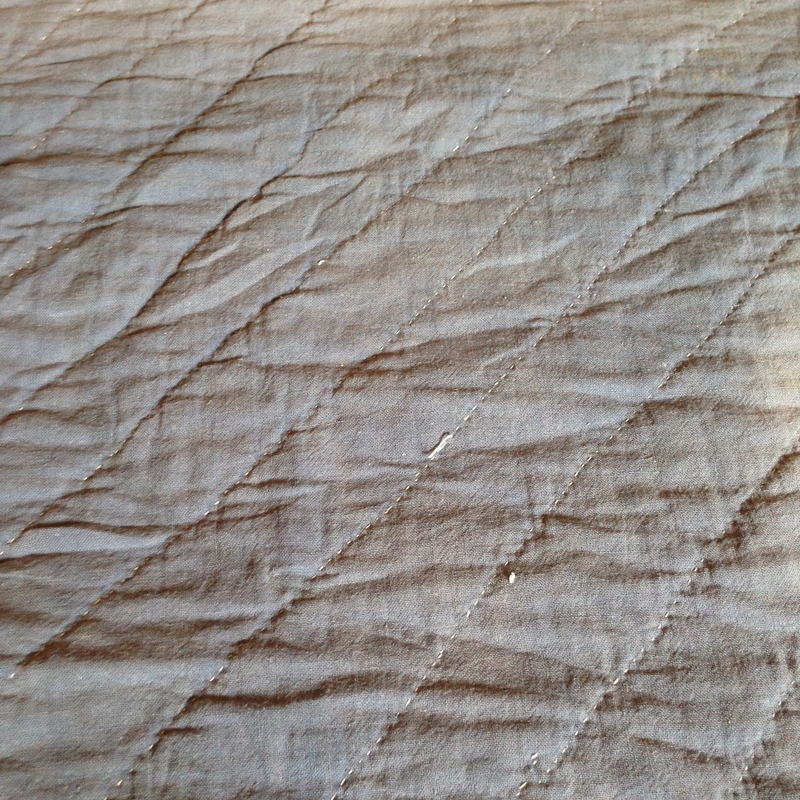 The machine stitching is very fine indeed which indicates it was probably stitched on a treadle machine. 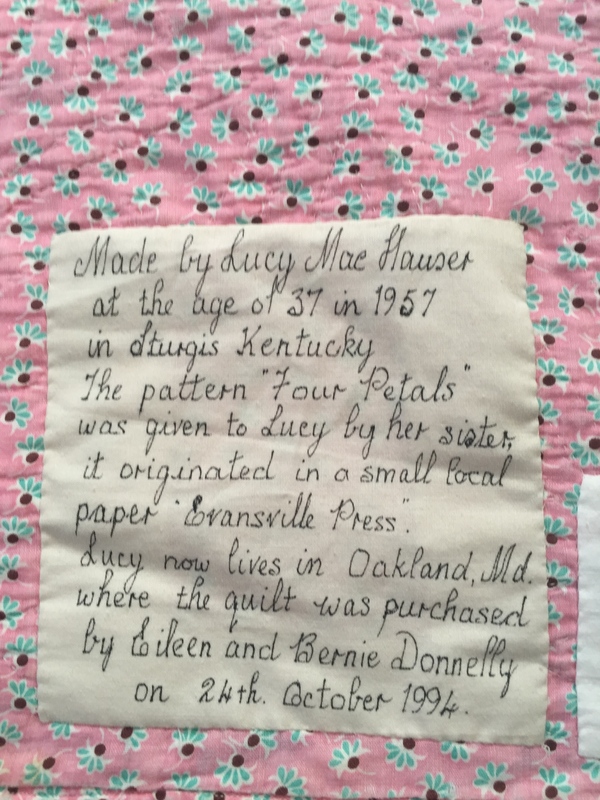 The story of Lucy’s Quilt was passed onto to me by Eileen and Bernie Donnelly who have entrusted this quilt and it’s story to me. 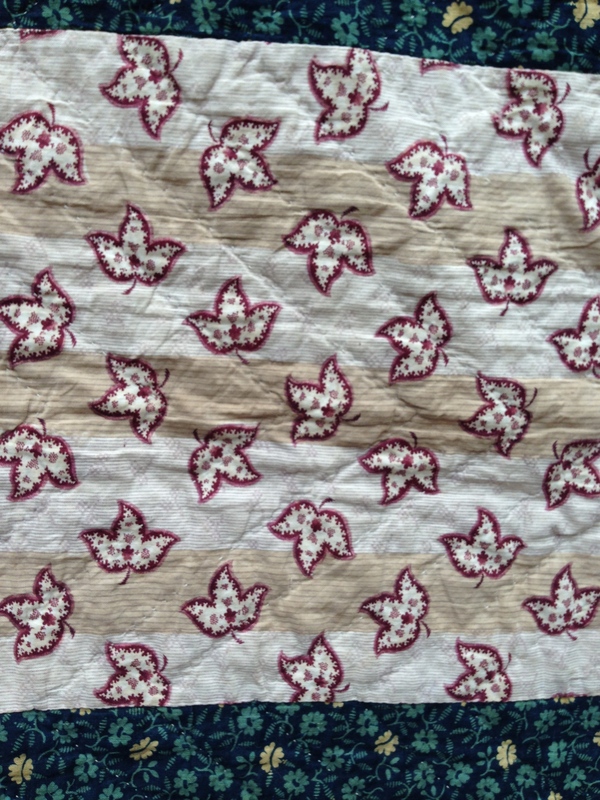 The story of The Four Petals quilt is reproduced here as told by Eileen and Bernie. ‘We were driving through West Virginia and Maryland on the last part of our trip. 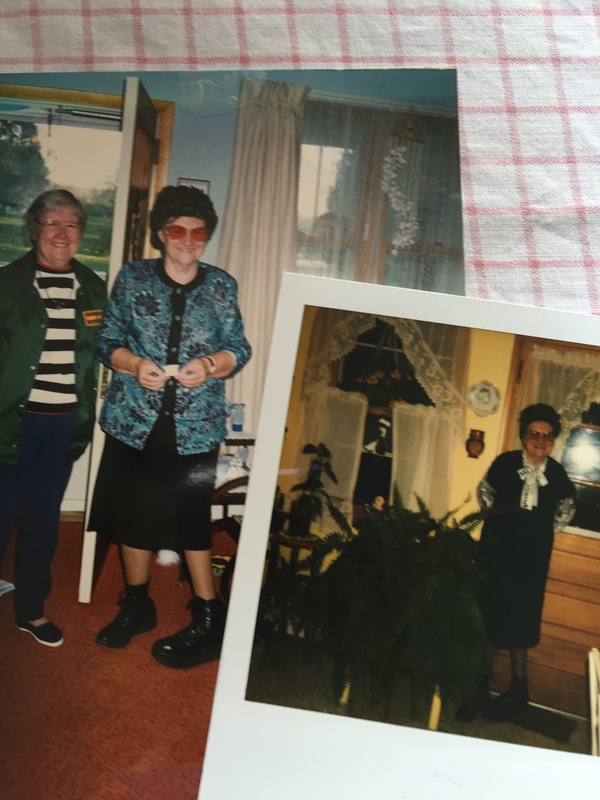 (October 1994) We were looking for old quilts and had been told by one of our son Stephen’s friends, who came from West Virginia, that “old” or Antique Quilts were no longer easy to find. They suggested we stop at some of the old general stores in the small country villages and ask. We did just that and were sent to see Mrs. Lucy Mae Hauser on her farm a couple of miles away. At this stage we we were right in the middle of the Amish country in Maryland, just near the West Virginia border. Lucy invited us in to show us what she had. She was absolutely thrilled to see us as she had not met Australians before. She told us she was 79 then she remembered she was only 76. She took us into a spare bedroom and pulled back a crocheted afghan to reveal a very bright quilt. “Railway Tracks” design. She said she had not sold quilts before, but would sell one to us. So we bought it, literally off her bed. Then she remembered she had some other quilts in the cupboard. She showed us “this one” and we liked it better than the one we had bought, so she agreed to exchange it, so we remade her bed. The Label beautifully hand written by Eileen. 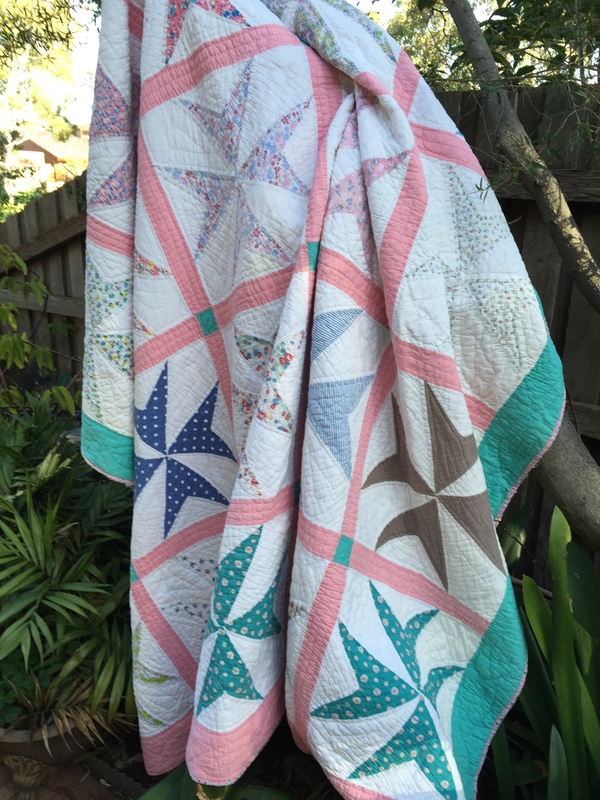 The instructions for reproducing this quilt were written by Eileen and published in The Australian Patchwork and Quilting Magazine Vol. 9 No. 4 February 2002. Hope you enjoy seeing The Four Petals Quilt and reading the story of it’s journey to Australia. 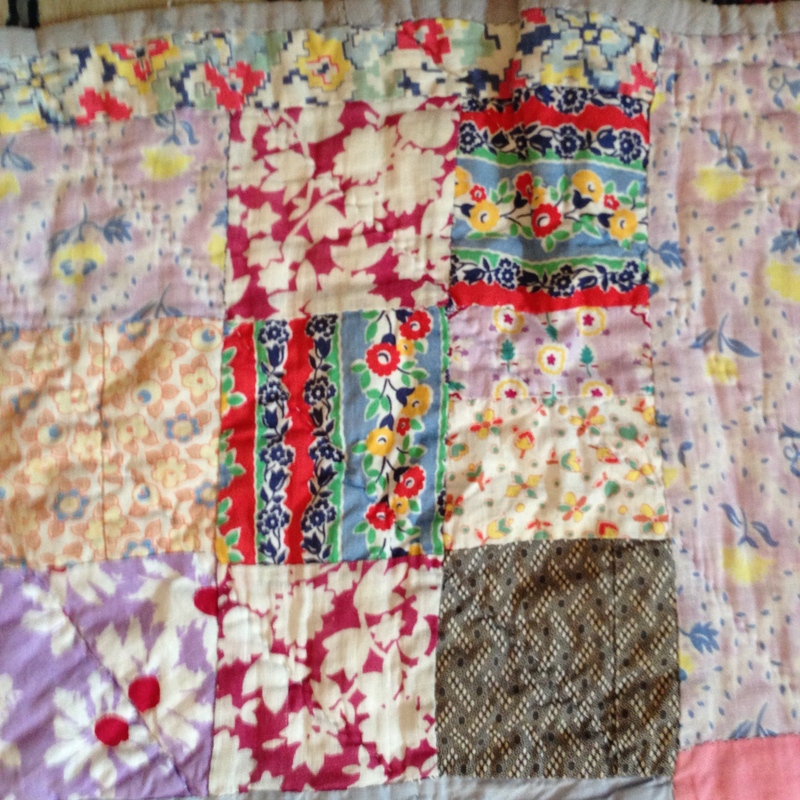 It is wonderful to have provenance of the maker’s of old quilts, so thank you to Bernie and Eileen for sharing the story of this lovely old quilt. Thank you for visiting The Plain Needlewoman. 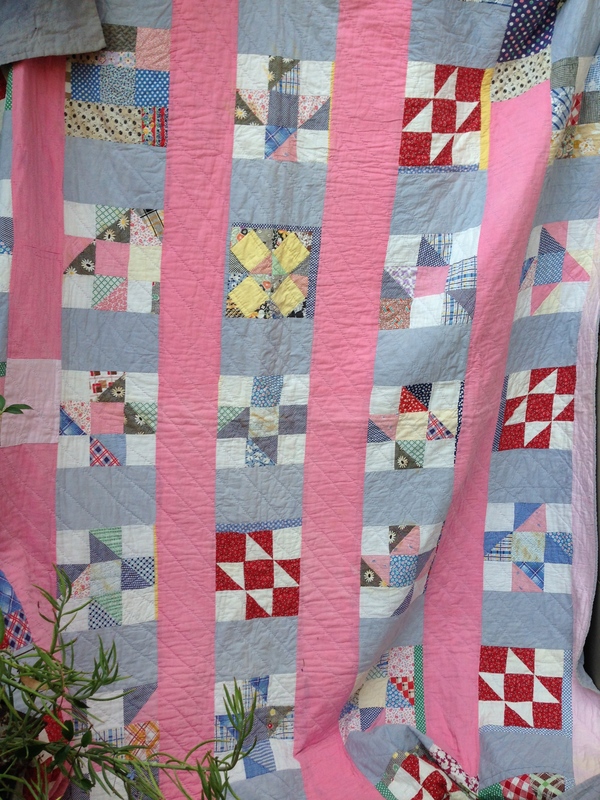 Not in her wildest dreams, would the maker of this quilt have imagined that her quilt would turn up for sale at an antique market in rural Victoria in 2015. When I saw the quilt for sale on a vendor’s display, I knew immediately it was an old English Strippy quilt. 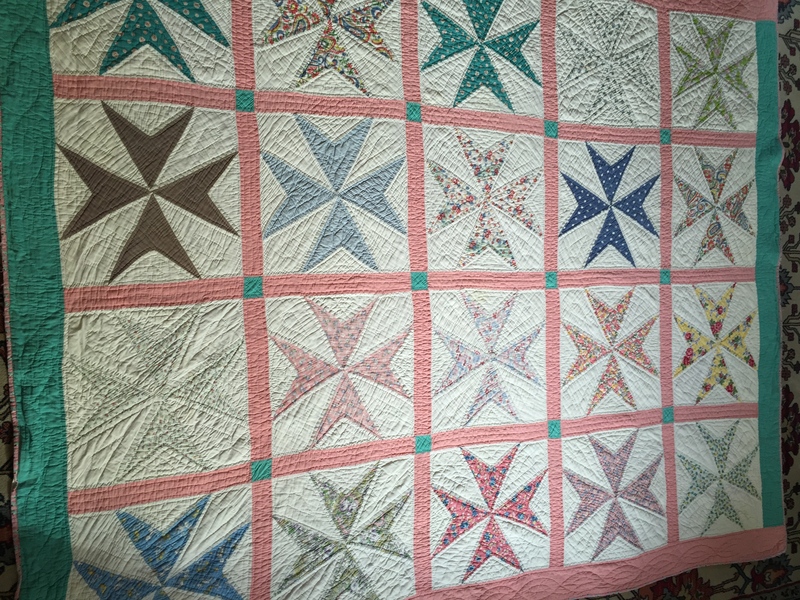 The seller confirmed she had purchased the quilt from an Englishwoman living in Australia. 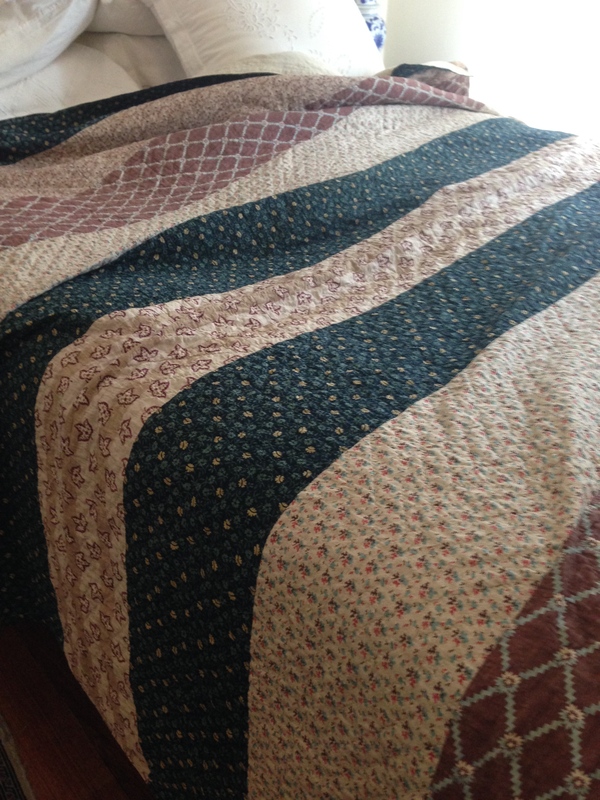 The seller had owned the quilt for some years and had enjoyed using it on her bed. 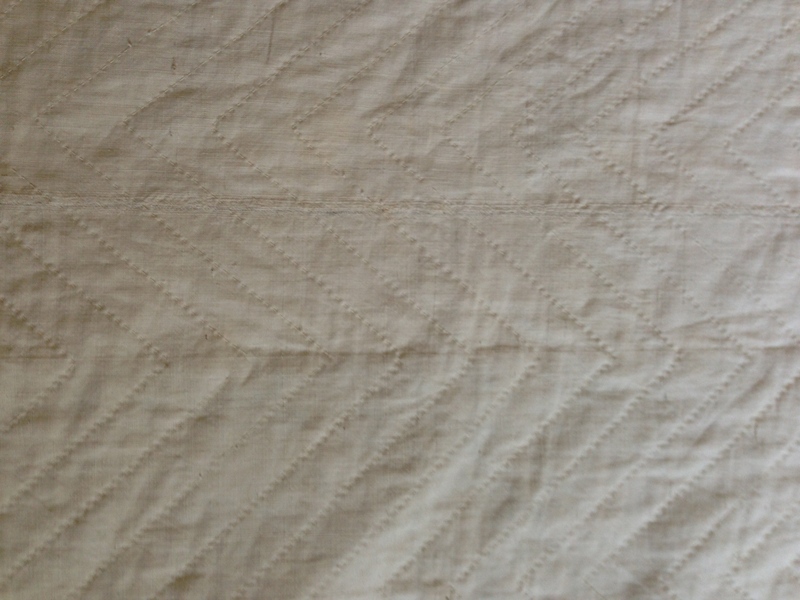 On studying this quilt, I could see that it’s maker had joined fabrics together to achieve the length required and in one instance has used a different print to do so. This may indicate that the maker was utilising fabrics already available to her. 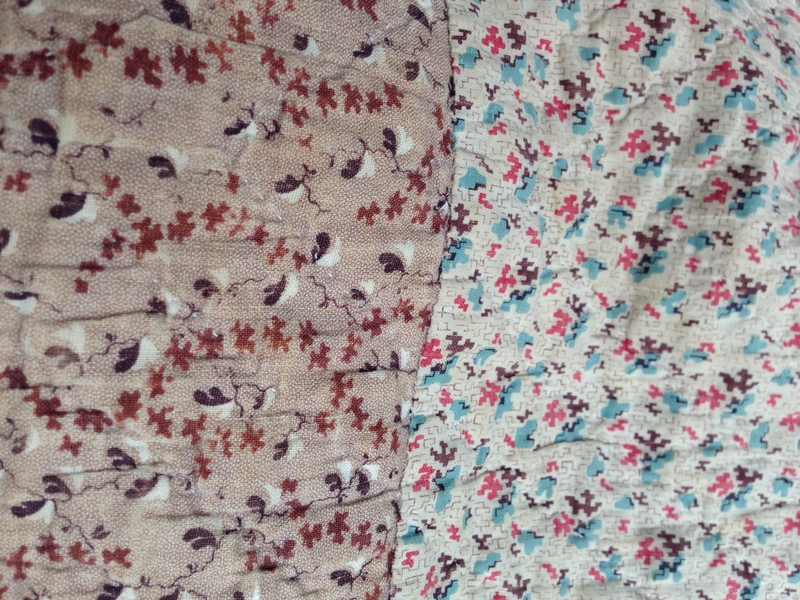 Two patterned fabrics joined to create length. 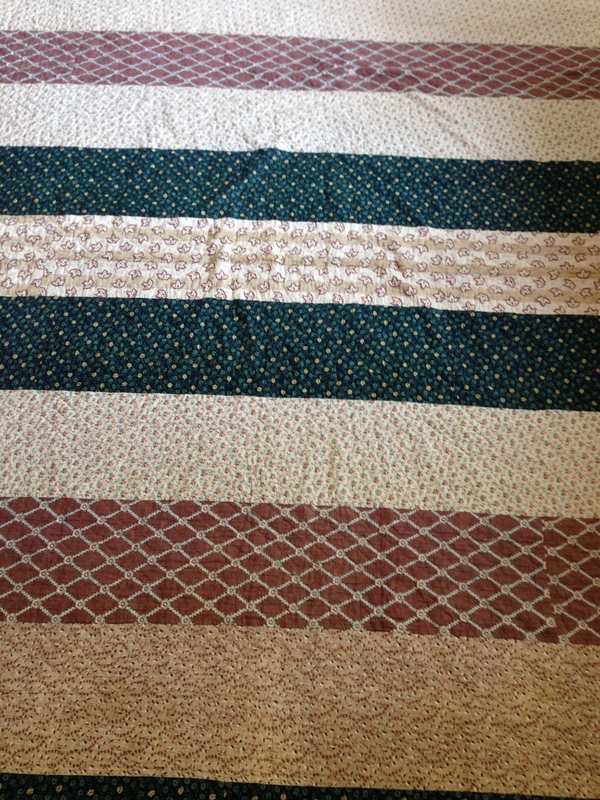 The quilt is constructed of eleven – 8 inch wide strips. There are five different fabrics used in this charming and humble quilt. The quilt is quilted in an all over zig zag design. I suspect it was quilted from the back as the stitches are very even on the back when compared to the front. Back of quilt showing hand quilting detail. The quilt measures 84 inches by 85 inches and there is some wear on the vertical edges. A couple of little patches stitched onto the quilt only adds to it’s charm. 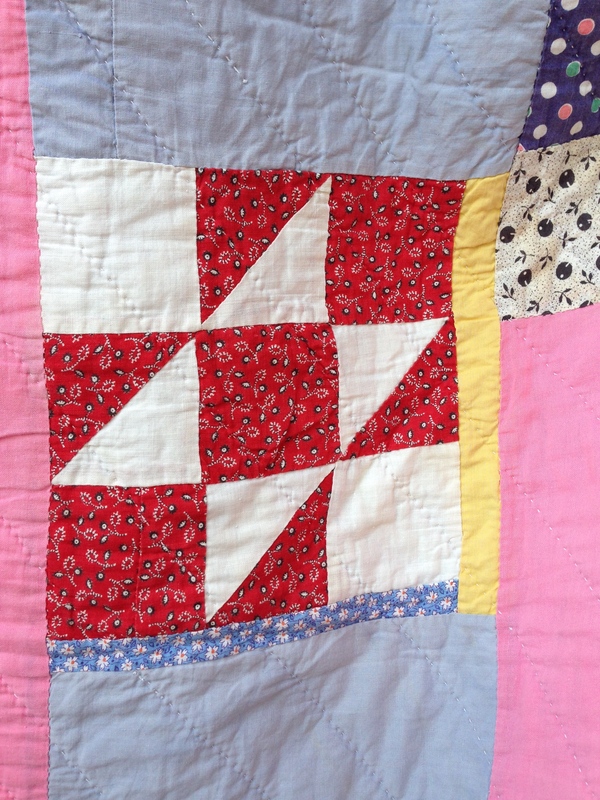 With clever joining of her fabrics and an orderly placement of contrasting colours this frugal quilt maker was able to celebrate her thrift and personality in a quilt that has had an interesting journey beyond its humble beginnings. Travelling in time and crossing the Atlantic Ocean to arrive in Tennessee USA we have another Strippy Quilt that demonstrates frugality and verve. 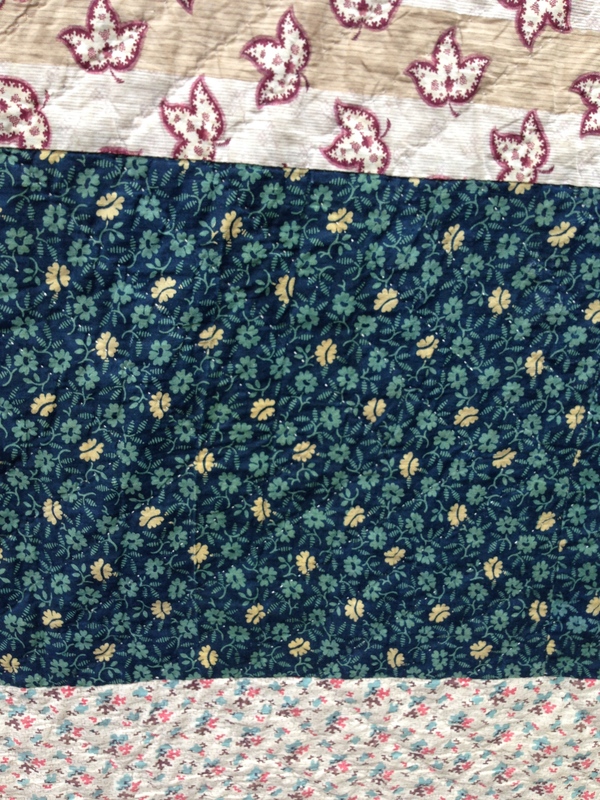 This quilt was purchased by the Donnelly’s (quilt collectors) in 1997 at the Donnelly House, Mountain City, Tennessee. It measures 86 inches by 87 inches. 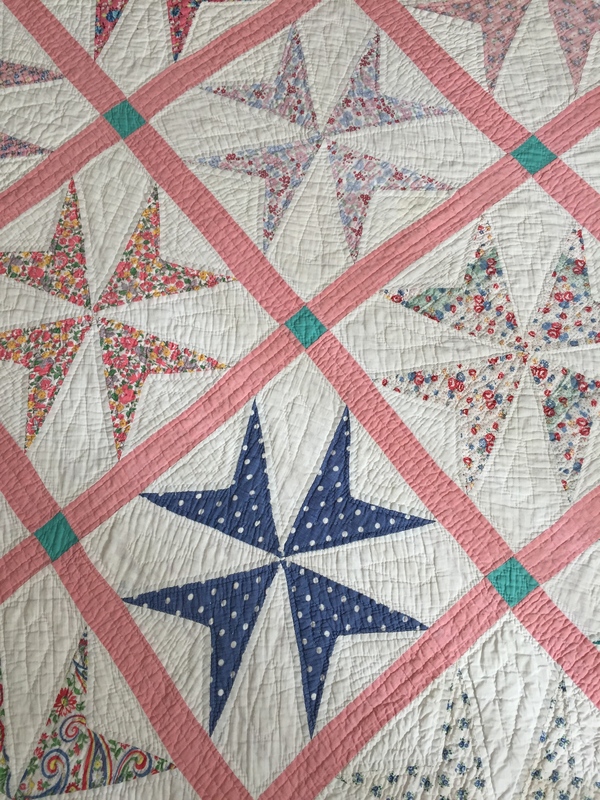 The assorted blocks that make up this quilt consist of stars, nine patch and album. 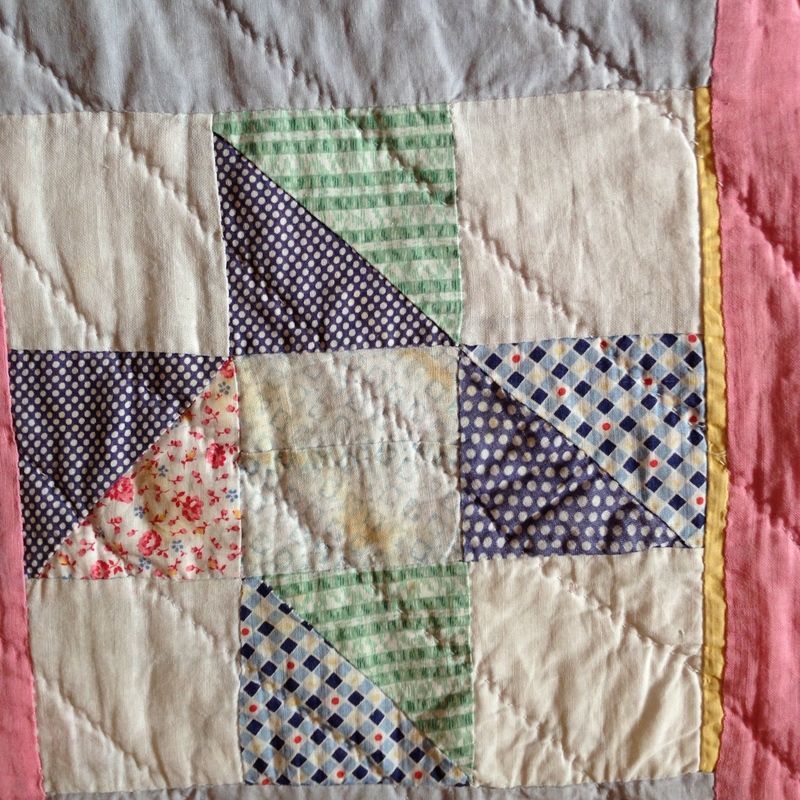 The quilt maker was not constrained by size, fabrics or colours. Many of the blocks have small strips added to make them fit. Yellow strip added to size up the block. The blocks date from circa 1880 through to 1930. The fabrics consist of shirtings, dress fabrics and feed sacks. 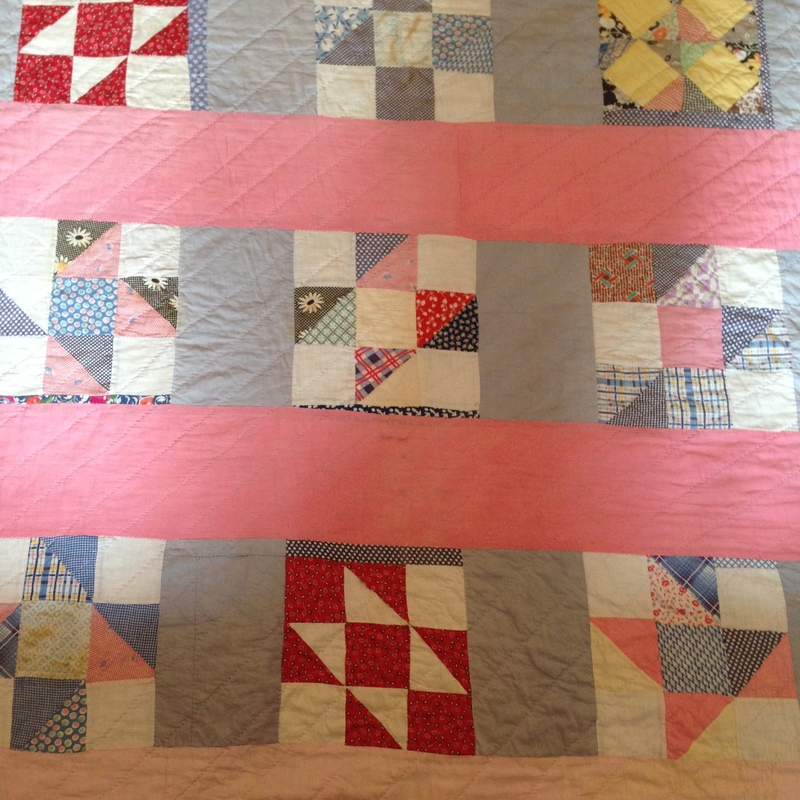 The strippy lay-out was achieved by joining the blocks with a hand dyed blue/grey fabric (probably faded over time) and then set into the strippy lay out with the pretty pink solid fabric. The backing is the same dyed blue/grey fabric which appears to be plain feed sacks as a feint print of lettering and a feed sack symbol is visible. 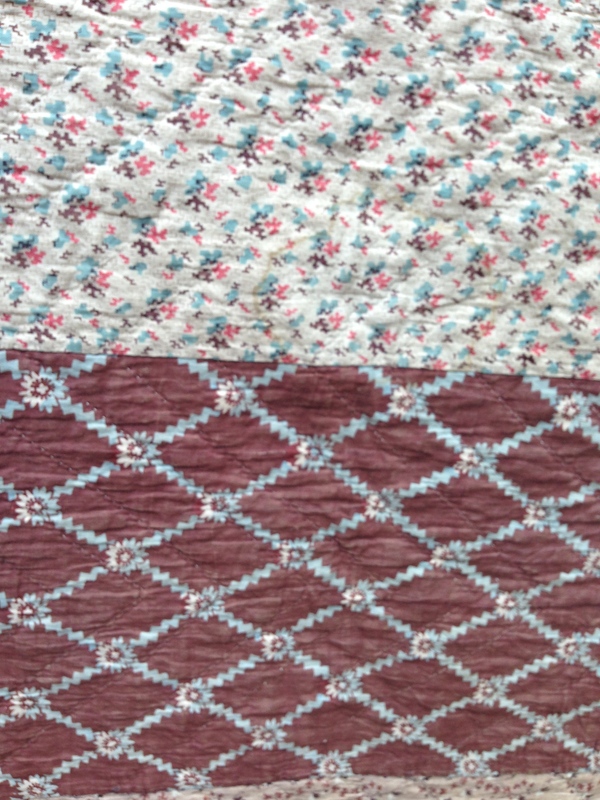 Block detail with hand quilting. Eileen Donnelly named this quilt ‘She did the best she could with what she had’, which I think is a perfect name and what I now call the quilt as well. 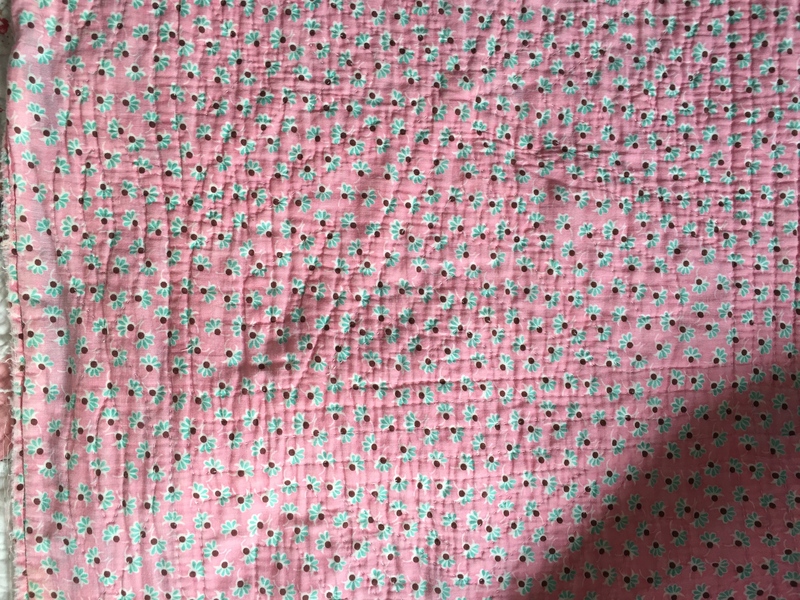 I think this quilt maker stitched a life time of quilting into a quilt that is a testimony to a frugal and creative quilt maker. 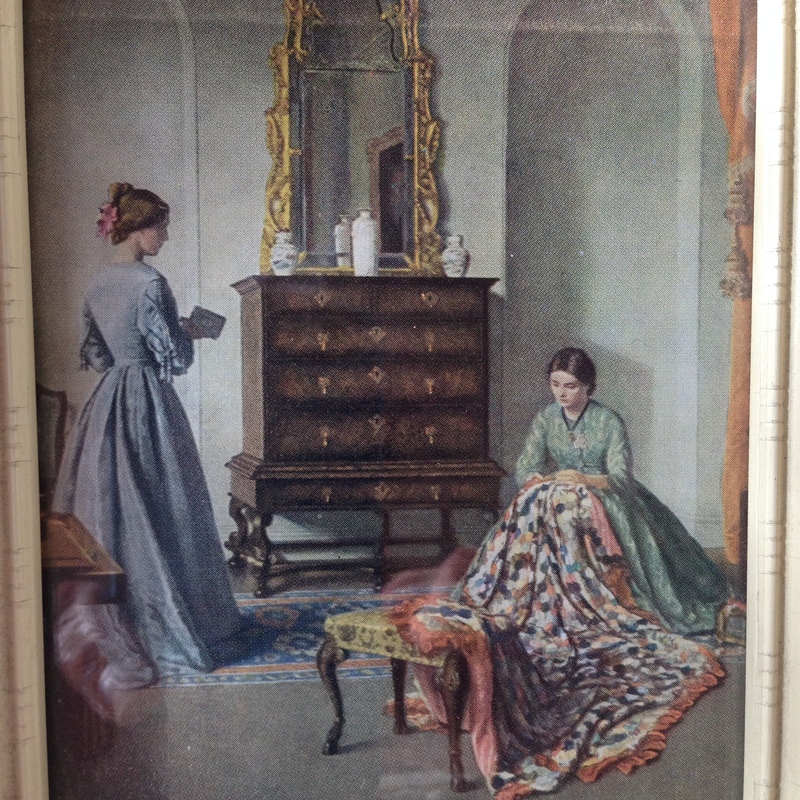 I would like to share this lovely print of a Plain Needlewoman working on a hexagon quilt.